At MAW Services, we’re trained and qualified to install and test any electrical works completed in your kitchen, bathroom or anywhere else around your home. In particular, bathrooms and kitchens (known in the wiring regulations as ‘special locations’) have strict rules governing the use of electricity, particularly around sources of water and moisture. When designing and installing your kitchen or bathroom it is important the regulations of BS:7671 (the IET 17th Edition Wiring Regulations) are closely adhered to, ensuring not only compliance with building reglations under Part P, but more importantly, you and your family’s safety. High quality lighting is an often overlooked feature of a new kitchen. But, not only does it improve a kitchens aesthetic qualities, it also provides a practical function by adequately illuminating the area in which you prepare meals. 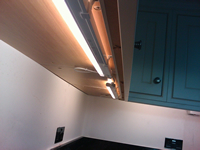 Under-cabinet lights will transform the ambience of your kitchen and we can offer a wide range of styles and technologies to suit. 1 IPX4 Yes. 25V a.c. and 60V d.c. SELV equipment allowed. Equipment allowed: whirlpool units, electric showers, shower pumps, vents, towel rails, lights, water heaters Yes. Only 12V a.c. and 30V d.c. switches of SELV circuits allowed, the source being installed outside zones i. Zone 1 reaches up to highest source of water or 2.25m above floor level (whichever is highest). 2 IPX4 (Shaver units complying to BS EN 61558-2-5 allowed when protected from direct spray) Yes. Fixed, permenantly connected (not plugged in) equipment allowed. Yes. SELV switches & sockets allowed, the source being installed outside zones. Shaver units to BS EN 61558-2-5 i. Extends 0.6m from edge of zone 1. Outside Zones No IP rating required Yes. General dwelling requirements apply Yes. SELV switches & sockets allowed, the source being installed outside zones. Shaver units to BS EN 61558-2-5 Yes. However, 13amp plug sockets are required to be a minimum of 3m from edge of zone 1. 13A socket outlets only allowed if 3 metres horizontally from zone 1. Shaver outlets complying with BS EN 61558-2-5 are allowed in zone 2. Allowed outside zones, which is a minimum of 0.6m from the edge of bath or shower. Must be manufactured to be suitable for the conditions. The operating cord (but not the switch, this is typically located 2.25m above floor level) is allowed in zones 1 & 2. 230V light fittings are allowed above bath or shower in zone 1 but must be IPX4, completely enclosed and water protected. If outside zones (0.6m from zone 1 or 2.25m above floor level) no special fitting is required but must be manufactured to be suitable for the conditions. Electric showers (BS EN 60335-2-35) and shower pumps (BS EN 60335-2-41) must comply with BSEN. Shower is permitted within zone 1. 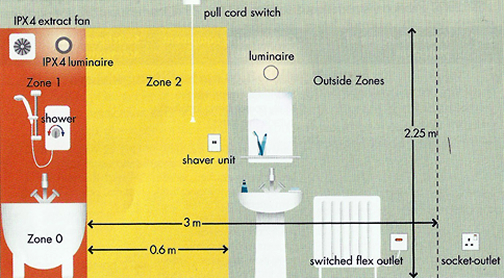 An isolation switch can be located in the bathroom; as with other switches in bathrooms, the operating cord (but not the switch, this is typically located 2.25m above floor level) is allowed in zones 1 & 2. 230V extractor fans installed in zones 1 & 2 must have an IP rating of at least IPX4. If powered from the lighting circuit and located in a bathroom without any windows it should have its own mean of isolation. This is to avoid maintenance to the fan being carried out in the dark. An isolation switch for a fan with an overrun (delay switch) will need to be triple-pole (switch wire, live, neutral) and (as with other switches in bathrooms) the operating cord (but not the switch, this is typically located 2.25m above floor level) is allowed in zones 1 & 2. Outside of zones any fixed equipment can be installed and doesn’t require any IP rating. However, due to the nature of a bathroom (steam, moisture, condensation) most standard equipment does not last long in this environment. It must be fed using a switched fused spur. Glazed tiles are the obvious choice for walls in bathrooms, kitchens and laundry areas. Glazed tiles are attractive on conservatory floors and in reception rooms but may not be suitable for potentially wet or outdoor use or heavy traffic floor areas. Generally used in domestic and industrial installations and are available with a slip resistant surface profile for floor tiling in wet areas. They are usually wear, stain and frost resistant; making them ideal for laundry and utility rooms, bathrooms, playrooms and garages. Extremely attractive and very hardwearing tiles that have extremely low water absorbency. Available as wall or floor tiles, sometimes glazed often with good anti-slip properties, they can be used internally and, providing they are slip resistant, externally. These tiles are suitable for domestic and commercial use. Made from natural clay, some are frost resistant and they may be used for floors internally and externally. Their natural clay surface usually provides good slip resistance and they are extremely hard wearing. Small pieces of ceramic, natural stone or glass usually sold in sheets on a mesh backing or paper facing for ease of fixing. Natural stone tiles include limestone, marble, granite, slate, travertine quartzite and sandstone. Whilst some natural stone tiles are extremely hard wearing the performance of these materials does vary. IKEA have a number of different ranges for every budget. All are compatible with the FAKTUM base cabinet; the foundation of the IKEA fitted kitchen. Design your cabinet placement (we can assist with design options too), choose your doors and drawer fronts, select your appliances and then call MAW Services to install it all for you at a fraction of the IKEA quoted cost. The B&Q IT range of kitchens offers great value and a truly diverse range of styles and designs. From sharp, simple, minimalistic contemporary kitchens, down to elegant and detailed classic kitchen designs, there’s a kitchen to suit every taste in this fantastic range of B&Q kitchens. They also have a vast collection of Cooke & Lewis kitchens, combining the very best quality and individual style perfectly. Made to an incredibly high standard, Cooke & Lewis kitchens come in a stunning selection of designs from edgy and modern to timeless and traditional. 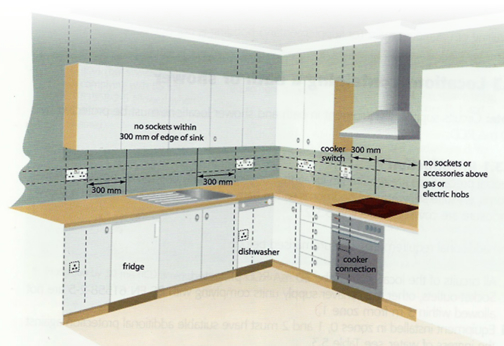 Call us to arrange the installation of your B&Q kitchen: 07799 204060/01444 616237. Homebase offer 4 ranges; Essential Kitchens, Homebase, Schreiber and Odina. Whatever the kitchen you buy from Homebase, MAW Services will guarentee you save considerably on the price quoted for installation. We’ll always include floor and wall tiling and any additional electrics and plumbing that maybe required. That’s not offered as standard by Homebase! Employing european designs, K specialises in infusing beauty with functionality in a range of kitchens that embodies style and longevity. K provides the perfect balance of practicality and style for modern living, offering a unique interplay between proportion, material and style, from modern classics to sleek contemporary styles.